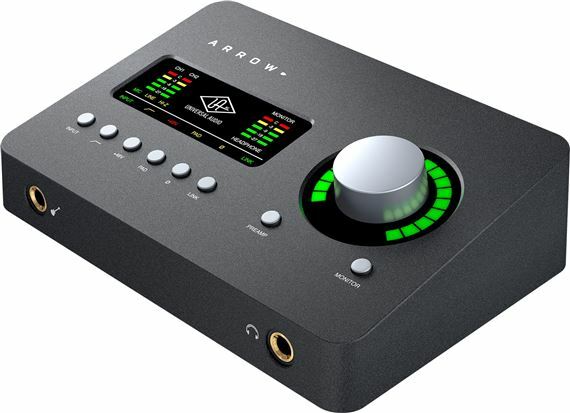 Order your Universal Audio Arrow Thunderbolt Audio Interface from AMS and enjoy 0% Interest Payment Plans, Free Shipping, Free Extended Warranty & 45 Day Money Back Guarantee. 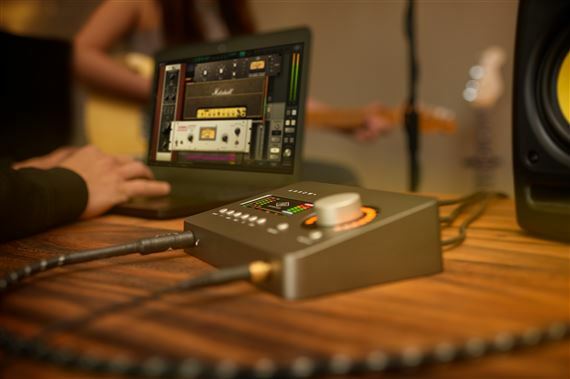 The Arrow is a desktop 2 x 4 Thunderbolt 3 audio interface with realtime UAD-2 SOLO Core processing for Mac and Windows. Get the incredible flexibility and sound of genuine UA conversion and access to the extensive UA library with this Thunderbolt 3-powered audio interface! The Universal Audio Arrow delivers class-leading audio conversion, two Unison mic preamps, and a suite of onboard UAD plug-ins so you can achieve truly great results in any recording situation. Home studios, mobile recording, singer-songwriters and many more will have everything needed and more to capture and create easier than ever! Shape your recordings into records — with genuine UA audio conversion and a studio full of classic vocal, guitar, and mixing tools. 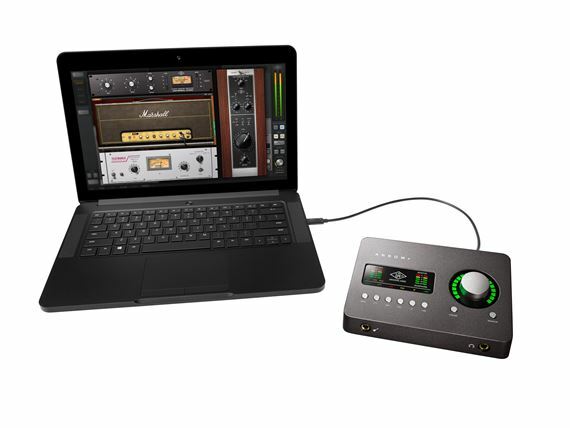 Featuring class-leading Universal Audio conversion, two Unison mic preamps, and a suite of built-in effects, Arrow puts album-quality recording on your desktop. This 2 x 4 Thunderbolt 3 bus-powered audio interface for Mac and Windows includes a generous collection of UAD plug-ins to record vocals and guitars through at near-zero latency — as well as acclaimed UAD studio mixing tools like classic compressors, EQs, and reverbs — for professionally polished tracks, right out of the box. 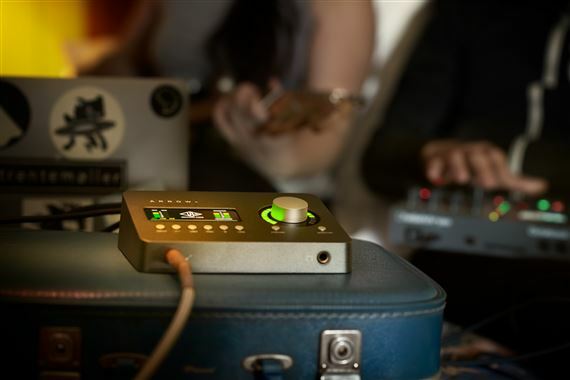 Arrow’s Unison technology gives you the tone, touch and “feel” of world’s most sought-after tube and transformer-based mic preamps and guitar amps. It includes the UA 610-B Tube Preamp, Marshall® Plexi Classic Amplifier, and Ampeg SVT-VR Classic Bass Amp plug-ins — and can be expanded with exclusive titles from Neve,® SSL,® Fender,® and more. 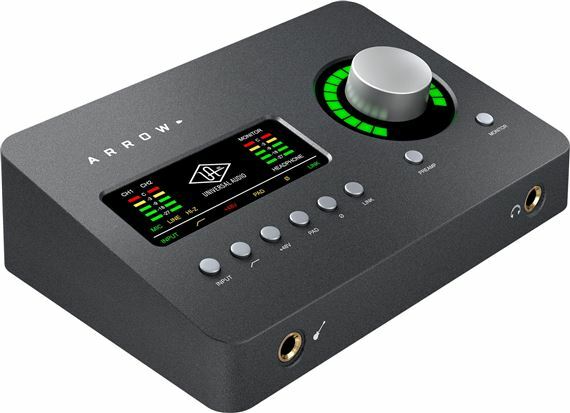 The secret is Arrow’s unique hardware-software integration, which adjusts the impedance of its instrument and mic preamps to match the emulated hardware — for authentic analog sound unmatched by other recording interfaces. 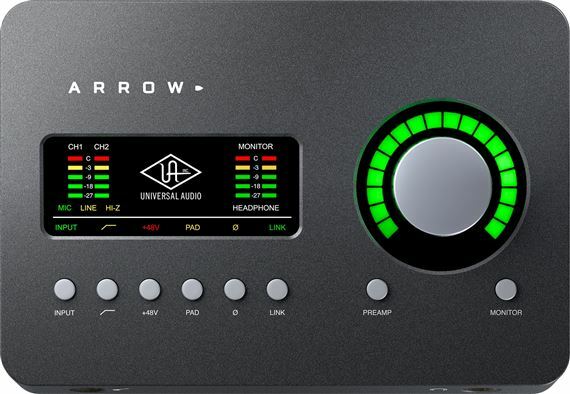 Derived from Universal Audio’s award-winning Apollo interfaces, Arrow opens up a range of classic analog color via its Realtime UAD Processing. 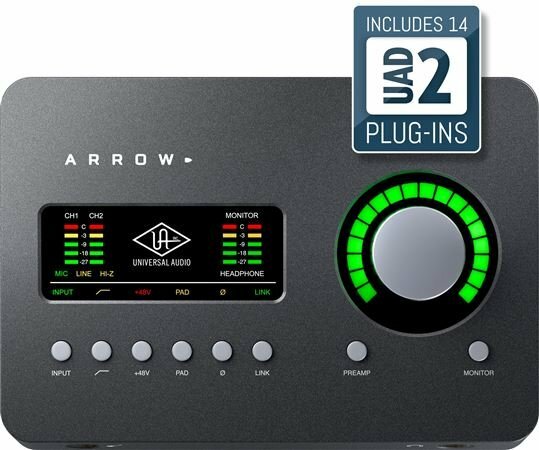 Featuring an onboard UAD-2 SOLO Core processor, Arrow lets you monitor and record through the full library of UAD Powered Plug-Ins — at near-zero latency, regardless of your audio software buffer setting. It’s like having a virtual analog studio that fits in a laptop bag. The UAD library features more than 100 titles and offers everything from classic Moog filters to Ampex tape to Lexicon reverbs — with more being added every few months. * These are the exact same UAD plug-ins used on hit records by Kendrick Lamar, Coldplay, Dr. Dre, Brad Paisley and many more. * Arrow includes the “Realtime Analog Classics” software bundle. 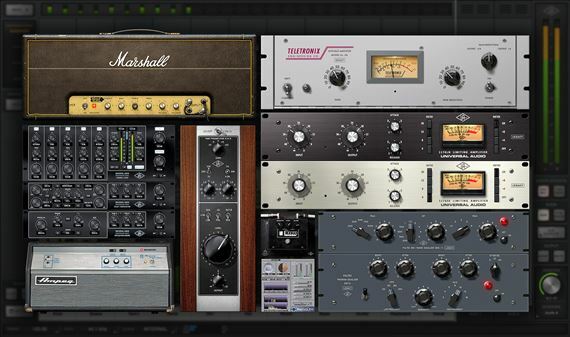 All other UAD Powered Plug-Ins sold separately at www.uaudio.com. All trademarks are property of their respective owners. Note: Arrow is bus powered by its Thunderbolt 3 connection to the computer. A power cable, external power supply or Thunderbolt 2 cable cannot be used to power Arrow. I'm very happy with the overall quality of the Arrow, from the preamps to the weight of the chassis to the excellent plugins. I wish I had bought a UA interface a long time ago! Excellent hardware and software combo. Good memory configuration for voiceovers. Best in its class. Perfect travel interface, love the fact I can just plug in thunderbolt cord and its powered. Super clutch. Sounds great, looks great and good quality for price point. UA provides a nice entry point for A/D recording. The knob is solid and it’s multi-functionality within the console is real highlight. The added plugins are also a nice bonus. It justifies the price. Easy to get plugged in and record. My opinion it’s one of the best interfaces to get. It’s so small and portable easy to use sounds great. Just plug in and Record and sounds great ! UAD killed it with this ! Great idea, almost perfect execution. Almost. Sounds great, great features, fantastic build quality. It only has one flaw, DSP. Not NEARLY enough DSP to be really useful. I thought it would use the DSP from my UAD-2 Octacore, but it doesn't. I can get one channel strip, maybe 1 compressor and if everything is perfect, a reverb (low DSP, NOT the one I want). On only one channel. I make it work because I don't record the reverb and I skip the compression but it really does limit the usefulness in a major way. While a quad or an octacore option would be fantastic, even a duo would be a major upgrade. A duo I could work with it. 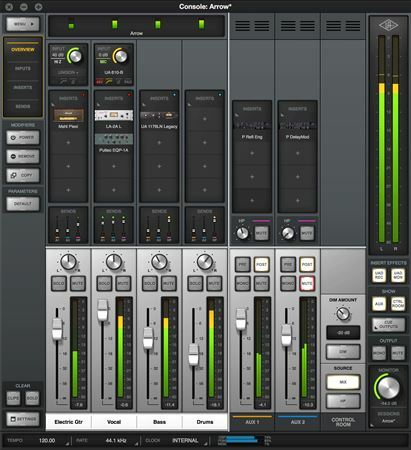 As it is, I use it for vocals to get the unison channel strip feature and my PreSonus Studio 192 for everything else. Purchase a new Universal Audio Apollo Twin or Arrow Audio Interface from AMS between April 1, 2019 and June 30, 2019 and receive free UAD plug-ins from UA upon product registration! Click here for further details.